Elsie Marie Hammack Griffies Moseley, 83, died Wednesday, March 13, 2019. A native of Gasburg, Virginia, Elsie was the daughter of the late Fletcher Alexander and Martha Ella Ellis Hammack. In addition to her parents she was preceded in death by her first husband; Lewis Earl Griffies, a granddaughter; Julie Marie Bass, brothers; William “Bill” Hammack and Johnny Hammack, a sister; Thelma Simmons. 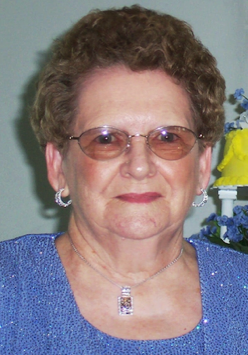 A retired homemaker, Elsie was a lifetime member of Pleasant Hill Christian Church. She enjoyed sewing and cooking, going places and eating out with her girlfriends, but truly loved spending time with her family and grandchildren. Elsie is survived by her husband; Milton Moseley, a son; David Griffies and his wife Robin, daughters; Kathi Griffies Woodruff and her husband Ricky, Betty Griffies Bass and her husband Edwin of Dunn, grandchildren; Katie Griffies, Emily Griffies, Allison Griffies, Sarah Woodruff, Timothy Bass, Thomas and his wife Lauren Evans Bass, Lauren Bass Benton and her husband Andrew, and one greatgrandchild “on the way”, Benjamin Edwin Bass. Funeral Services will be held Saturday, March 16, 2019 at Noon at Pleasant Hill Christian Church in Gasburg, Virginia with Minister Greg Hand and Rev. Sue Owens officiating. Burial will follow in the Church Cemetery. The family will receive friends at the Church from 11:00 A.M. until service time. To send online condolences please click here.